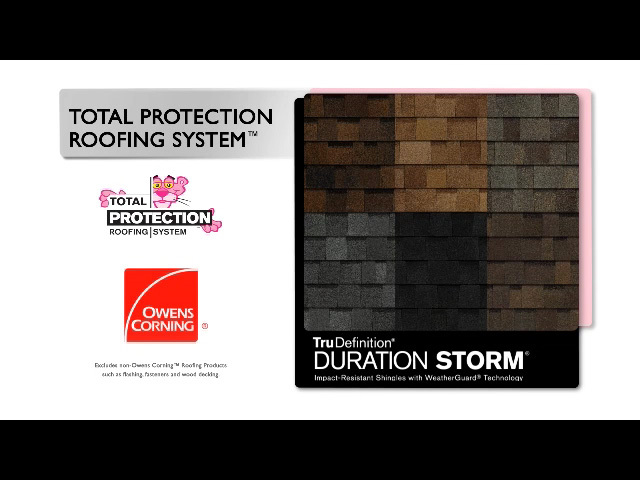 Unlike standard shingles, TruDefinition Duration STORM impact-resistant shingles feature patented WeatherGuard® Technology. The integrated polymeric backing material of the WeatherGuard Technology allows Duration STORM shingles to meet one of the industry’s highest ratings for impact resistance, UL 2218, Class 4. In some areas, homeowners may qualify for insurance premium discounts – check with your insurance company. 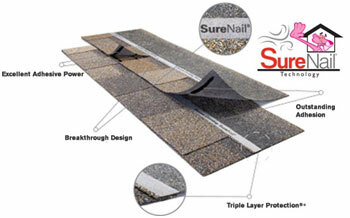 These shingles also feature SureNail® Technology for high-performance durability and outstanding gripping power. Algae species are naturally occurring and transported through the air to attach themselves to shingles and other surfaces. While algae growth can cause brown or black streaks on roofs, it does not impact the performance of your shingles. Streaks caused by algae growth are more common in warm, humid climates but can occur in all regions of the country. Owens Corning has continued to advance our algae resistance protection based on over 30 years of testing and experience. Shingles with StreakGuard™ Algae Resistance Protection can help inhibit the growth of blue-green algae*. In areas where severe weather is common, consideration should be given to shingles that offer an impact resistance feature.. The UL 2218 Test Standard is a common classification system that provides a method of rating impact resistance for asphalt shingles. Four Class designations for impact resistance are available with Class 1 the lowest (least impact resistant) and Class 4 the highest (most impact resistant). Patented WeatherGuard Technology has at its core an integrated polymeric backing material on the back of the shingles that allows the shingles to meet the industry’s highest classification for impact resistance—UL 2218, Class 4 Impact Resistance. Corresponding ProEdge STORM® or WeatherGuard Hip & Ridge Shingles are required to complete UL 2218 Class 4 Impact Resistant Roof System for warranty coverage*. Homeowners may qualify for insurance premium discounts—check with your insurance company. *See actual warranty for complete details, requirements & limitations. Not a guarantee of performance in all weather conditions.